ARPAPRESS is an academic research publishing agency which focuses on publishing research with an Open-Access model so that everyone can access it free of cost. We focus on quality research. We are soon introducing new journals to cover wide range of academic desciplines. International Journal of Research and Reviews in Applied Sciences ISSN: 2076-734X, EISSN: 2076-7366 is a multidisciplinary, an International refereed research publishing journal in which research and review articles are welcome from areas of Bioinformatics, Biotechnology & Applied Biological Sciences Applied Physics, Mathematics and Statistics, Bussiness and Economics, Electronic Engineering, Civil Engineering, Applied Chemistry, Energy Resources Research, Environmental Engineering, Industrial Engineering , Mechanical Engineering , Mining Engineering, Biomedical Engineering & Computer Science. Our aim is to promote and disseminate knowledge to the world by publishing quality research. As we follow Open-Access model, it faciliates the academicians and researchers from various labs and institutions to download the published articles free online. Volume 38 - Regular Issue of International Journal of Research and Reviews in Applied Sciences (published). Volume 39 - Regular Issue of International Journal of Research and Reviews in Applied Sciences(In press for publication). International Journal of Research in Mathematics (JRM) is a peer-reviewed, Open Access journal that publishes original research articles as well as review articles on all aspects of both pure and applied mathematics. JRM aims to publish original research and focuses to be a source of high quality research which will be available forever and free for all readers worldwide. We aim to publish papers on time, without any delay and review as fast as possible. Each submitted manuscript is reviewed by at least two reviewers under blind-peer review process. Journal of Mathematics is a broad scope journal that publishes original research articles as well as review articles on all aspects of both pure and applied mathematics. Submissions are requested for the Regular Issues of International Journal of Research and Reviews in Applied Sciences. 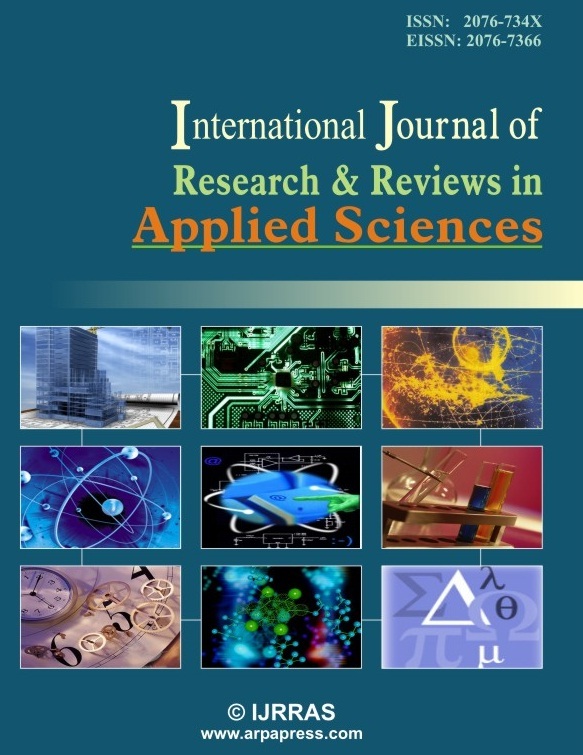 International Journal of Research and Reviews in Applied Sciences is an interdisciplinary journal of Mathematics and Statistics, Bussiness and Economics, Applied Physics, Electronic Engineering, Civil Engineering, Applied Chemistry, Energy Resources Research, Environmental Engineering, Industrial Engineering , Mechanical Engineering , Mining Engineering, Biomedical Engineering, Bioinformatics, Biotechnology & Applied Biological Sciences & Computer Science. The objectives of journal is to encourage original contributions of major research ventures and is focused towards research being carried out in mentioned fields and emerging innovations by scientists, technologists and engineers in the modern era as Sharing knowledge is essential for the progress of science. Its aim provides a forum to assist the academic staff and industrial technologists from local and foreign institutions on publishing research results and studies through this scholarly publication and make the newly created knowledge readily available to the sceintific community.